Originally published digitally as part of David Lloyd’s Aces Weekly line-up, Adam Wilmot and Pete Taylor’s Monster Kids: Show and Yell is a suitably creepy all-ages offering featuring the misadventures of a small class of ghoulish schoolkids. It’s the first day at school for Lovecraft Institute for Netherthings exchange student C’Thoo and his classmates prove to be a motley crew indeed. There’s the unsettling twins Ivy and Luna, bog-creature Peat, Eugene the little vampire who is scared of blood, and the eternally optimistic skeleton Rey. As the kids embark on a quest for items for the class ‘Show and Tell’ – one that will take in alternate dimensions, malevolent forests and haunted houses – can the newbie from the Netherworld find his place in this odd social structure? C’Thoo serves as our entry point into this strange environment but the target audience will no doubt quickly latch on to their own favourites among the cast. If you’ve been around the comics world for long enough, of course, you’ll be familiar with the core concept. The comedy exploits of supernatural juveniles have a long tradition in kids comics after all. 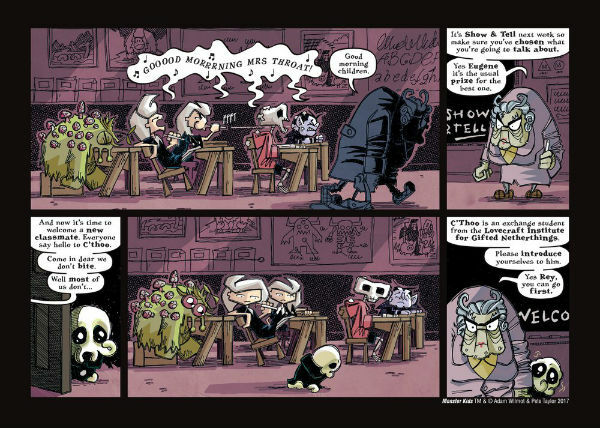 But it’s the execution rather than the originality of the premise that is the strength of this rather charming book. Wilmot and Taylor provide a number of episodic set pieces focusing on the individual characters that coalesce into an overarching storyline eventually bringing all players together for a fun finale. 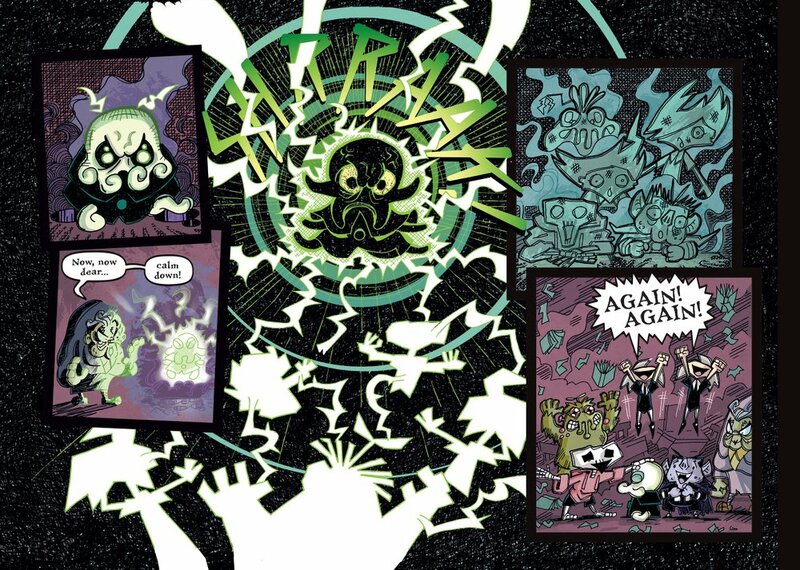 Taylor’s quirky, often angular characters and busy, energetic visuals will doubtless capture the imagination of the younger readership and the landscape presentation works effectively to create a sense of perpetual, fast-paced movement. 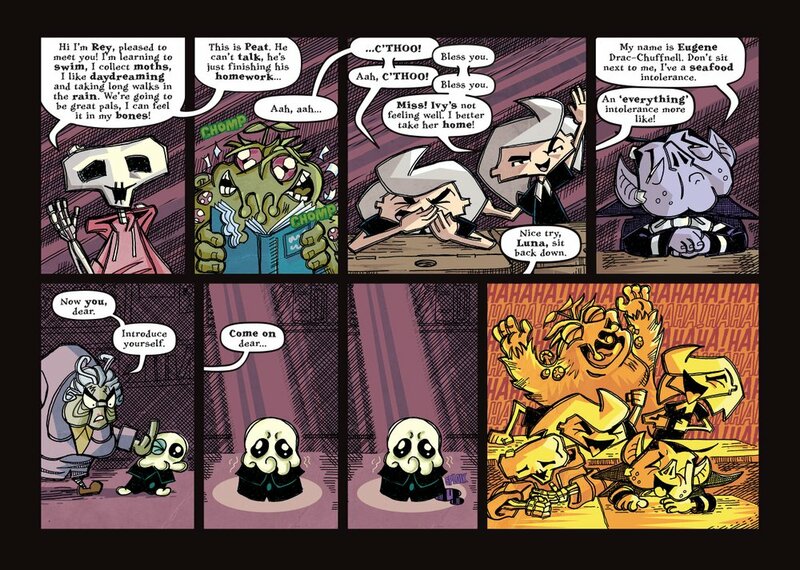 And for the older comics enthusiast there is some clever storytelling inventiveness on show – characters moving through the environs of a mansion within a single image, for example, or the space between panels being used as a method of transport between different dimensions. Slapstick lettering effects also add to the atmosphere. 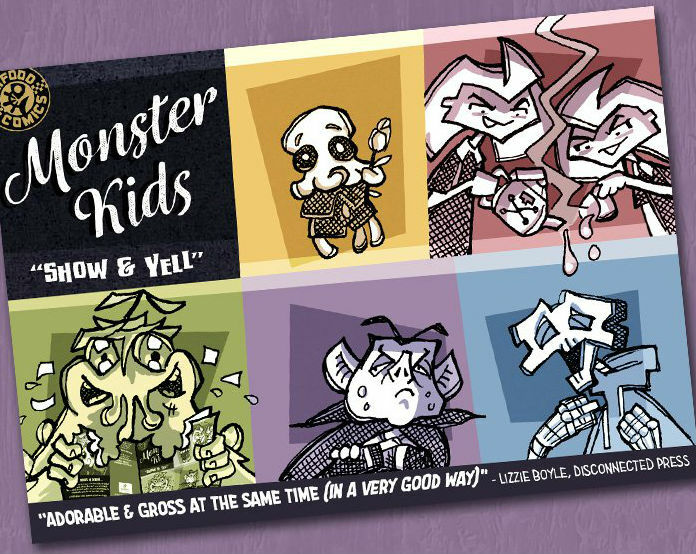 Monster Kids is carefully and cleverly pitched. The characters are never sinister enough to be unlikeable – indeed the horror elements are really only a colouring on very recognisable themes of growing up and fitting in – and their ultimate motivations are actually very human in scope and intent. 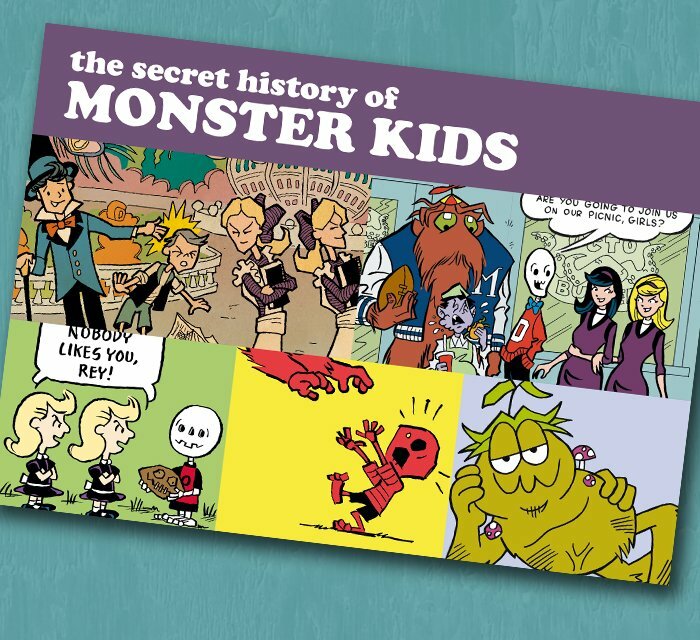 An accompanying and rather fun The Secret History of Monster Kids provides a fictional history of the strip. 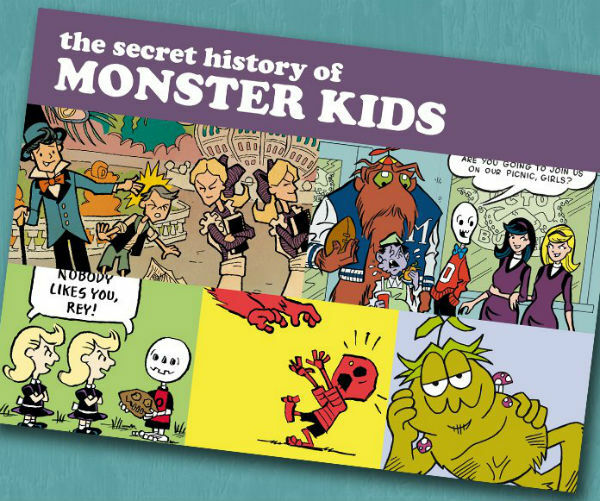 It follows the development of the comic from the days of early newspaper strips through the decades until contemporary times taking in, amongst others, Peanuts, Harvey/Archie and Calvin & Hobbes re-imaginings of the crew. A perfect self-published offering for the Beano or The Phoenix-loving younger readers in your life. You can order Monster Kids in print online here. 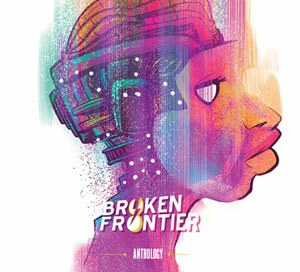 It is also available on ComiXology. 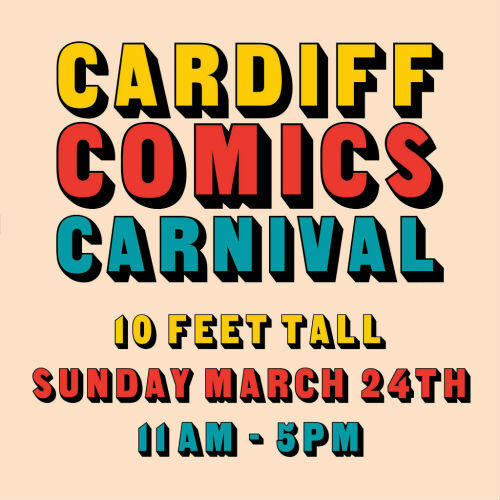 This Man This Pete is exhibiting at the Cardiff Comics Carnival this Sunday March 24th.